Wireless sensor networks consists of spatially distributed autonomous sensors to cooperatively monitor physical or environmental conditions, such as temperature, sound, vibration, pressure, motion or pollutants. Applications for wireless sensor networks are varied, typically involving some kind of monitoring, tracking, or controlling. Specific applications include habitat monitoring, object tracking, nuclear reactor control, fire detection, and traffic monitoring. 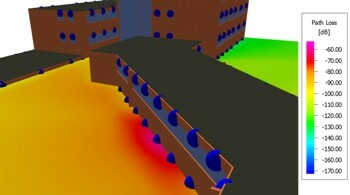 Altair develops a software package for the simulation of such wireless sensor and MESH networks. Determination of optimum paths between sensor and gateway nodes taking into account different criteria, such as best SNIR, minimum path delay, etc. The simulator provides the possibility to model wireless sensor networks with different types of nodes, e.g. standard and gateway nodes. In order to simulate and analyze the connectivity between the nodes of the network in different environments (rural, urban and indoor), the occurring path loss between the sensor nodes will be calculated based on the underlying propagation scenario. Depending on the wireless air interface of the system, interference calculations can be done as well. Self-organizing sensor networks are built from sensor nodes that can spontaneously assemble the network themselves, dynamically adapt to device failure and degradation, manage movement of sensor nodes, and react to changes in task and network requirements. Reconfigurable smart sensor nodes enable sensor devices to be self-aware, self-reconfigurable and autonomous. Within such dynamic networks, the channel and interference conditions vary continuously, depending on the instantaneous locations and settings of the nodes which currently built the network. The assignment of the radio channel, a node is using for communication with the other nodes, can therefore be reconfigured either in specific time intervals or on demand, in order to maximize the signal-to-noise-and-interference-ratio (SNIR) at all nodes of the network. 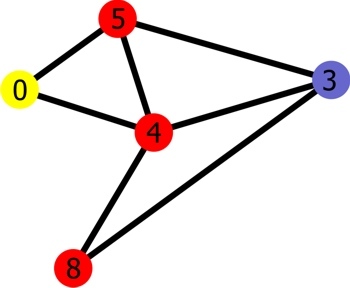 Not all nodes of a sensor network might have a direct connection to the other nodes within the network, especially to the gateway nodes, due to limitations in the link budgets. Therefore, the information send from a node far apart from a gateway has to be received and re-transmitted from other nodes of the network and passed towards a gateway node, i.e. the information hops over several nodes, which build up a path between the source and the sink of the information. These 'information flow' paths can be determined depending on the predicted radio channels between the nodes and the specified service requirements of the air interface. Beyond this, the optimum path between a sensor node and a gateway node can be found taking into account different user defined criteria, such as minimum overall path delay, link stability, etc. By default, the optimum path is determined using the well known Dijkstra algorithm, but the user has also the possibility to implement and use his own algorithm via an open application interface. The animation above shows the implemented Dijkstra algorithm for finding the optimum 'information flow' path between a sensor node (yellow node on the left) and a gateway node (blue node on the right). The weight factors, which are written on the edges between two nodes are determined according to single or multiple user defined criteria.